The Family; The Brain Boost! So far we have looked at The Family from several aspects; the Smallest School, the Beginning of the Beginning, a Serious Decision, the Uterine Environment and the Moment of Birth, and Postpartum Dads. In thinking about all of this I looked at my own story and how I came to understand the serious nature of birth and childhood. It is an important decision to bring another human life in the world. But the most important parental duty of all is to ensure that the new life in your family has a chance for reaching its full potential. It doesn’t take a PhD to raise a child in a responsible, loving, family environment. It takes careful thought, selfless action, and parental bonding. Unfortunately for the newborn child, many parents have little understanding of the most crucial and yet often neglected aspect of a newborn life, Brain Development. It is not necessary to understand all of the intricate scientific brain stuff. It is only necessary to have an understanding of the family experiences parents can present which will boost brain growth. Then a common sense, practical approach to early childhood rearing provides the proficiencies that develop Brain Growth in a way that allows your infant to leap forward into their promise. Did You Know This Mom & Dad? •	Most people do not yet know that 90% of children’s brains are developed in the first 5 years, and 85% in the first 3 years. The brain adapts and grows primarily based on the experiences a child has in these years before they enter school! •	A developing brain will adapt to whatever happens repeatedly in the environment. For a brain to develop optimally, a child needs to have fun, interesting, loving experiences throughout the day. •	Environments that are chaotic, disorderly or have high levels of stress have a direct influence on how optimally a child’s emotional and thinking areas of the brain develops. •	The easiest time for the brain to learn a second language is during the pre-school years. Research indicates there may be additional benefits when learning multiple languages. Children can develop better overall verbal skills, a better vocabulary, and sequencing abilities. •	The brain is ready to learn basic math skills in the pre-school years. It doesn’t occur from saying the numbers in order. It learns through doing comparisons of size and shape, and few and many. Connections will be made in the brain when this is done with real objects. •	Research demonstrates that nature helps the brain relax and restore itself after experiencing stress or negative emotions. •	The quality and quantity of exposure to nature directly affects the physical health of the brain. •	Even though the brain is making trillions of connections as an infant and toddler, it takes years throughout childhood and adolescence to organize it into a mature adult brain. •	The quality of the relationship an infant has with his or her parents has a direct impact on the physical development of the brain. This impacts the nature and extent of a child’s perceptions and capabilities. •	Loving interaction with people and exploration of objects is as necessary to a child’s brain development as food. •	By the time a baby is 6 months old the brain may have developed 1,000 trillion brain connections through experiences in their environment. •	A child has already developed a perception of self and their environment by 12 -18 months based on the relationship they have with their parents. •	Brain connections for language are developed through direct interaction with parents NOT through television and videos. •	Aggression, impulsiveness, and lack of empathy can result when a brain experiences repeated neglect, chaos, or violence. •	The brain does not like chaos. It feels more comfortable when it knows what to expect. •	The absence of consistent and quality experiences leads to a loss in brain potential. •	Physical play stimulates the emotion regulating areas in the brain. •	Once the brain is developed it takes much more repetition, time, and consistency to change what has already been hard wired. •	The brain is always changing and making new connections. However, it is more difficult to modify after it has been originally wired in the newborn. None of the above is out of reach for any parent. Early Brain Development is NOT complicated and it makes an impact that affects every one of us, especially our children. It only takes time, love, and creative thought. Each child deserves a Brain Boost in their first years, without it they are destined for a life of mediocrity and boredom. Let’s talk about the uterine environment and the moment of birth. What happens in the uterine environment at birth? Maybe if we had a clear perception of this moment in life we might have a better understanding of our child creation and the enormous responsibility that comes with parenting during conception, fetal growth, and infant health; all of which are essential before a child even begins their first step towards life. Let’s look at the Latin word ‘infans’. It means ‘not speaking’ and hence the word infancy has come to mean the first year of childhood. Humans are born naked, helpless, and vulnerable. Humans have a long gestation period without obtaining great size or maturity at the time of birth. Another human peculiarity is the size of the brain, which weighs about 350 grams, or .772 pounds, at birth or is 10% of the average total body weight. 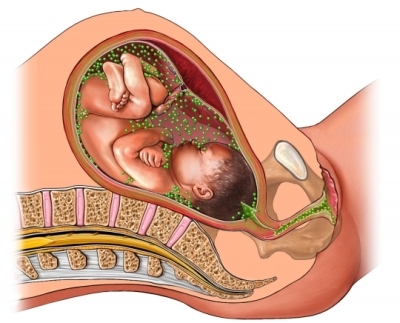 The fetus adaptation from complete dependence upon the maternal uterine environment and placenta to the extra-uterine environment requires major changes in the infant body organs. Within a minute of the cessation of placental blood supply and the delivery from a watery to a gaseous environment, the infant lungs, heart, skin, and the alimentary, renal, and nervous systems undergo a series of dramatic functional changes. During pregnancy the fetus depends on the mother for obtaining oxygen and nutrients, and for the excretion of carbon dioxide, heat, and other metabolic waste products through their combined bloodstreams. Upon birth the infant must fend for itself. More blood flow must be directed through the lungs for gas exchange, to the gut for nutrient absorption, to the kidneys for urine formation. But first and foremost, breathing must begin. Fetal breathing movements are necessary for normal lung development in the womb. The patterns of these movements are related to the ‘sleep’ and ‘awake’ states of the fetus but may also be affected by external factors such as maternal smoking, drinking, drug abuse, and unhealthy diets. Normal vaginally-delivered infants make their first breathing movements within 20 to 30 seconds from the emergence of the nose. Within 90 seconds of complete delivery most infants have started to breathe rhythmically. The circulation of the blood is drastically re-routed at birth. In the fetus there was relatively little blood flow through the lungs. Oxygenated blood reached the fetus from the placenta in the umbilical vein and joined the blood entering the right side of the heart. Most of this blood bypassed the lungs. After birth, the right ventricle must pump all the blood it receives through the lungs. This change is assisted by the onset of breathing itself. The expansion of the lungs with air reduces the resistance to flow in their blood vessels. There is a continuum of nutrient supply by the mother from conception until after complete weaning. Even after weaning in most human societies, the mother is primarily responsible for helping the immature offspring to obtain adequate nutrition. The importance of optimal nutrition in human fetal and neonatal life is crucial in early life. Studies strongly indicate an increased incidence of hypertension, strokes, diabetes, and coronary artery disease in later life when the mother neglects her responsibilities for supplying healthy nutrition to her fetus and infant. The human infant has relatively large stores of lipid, carbohydrate, and important nutrient elements such as iron. After birth, fat and lactose supplied in the mother’s milk are the major sources of energy, whereas before birth glucose supplied by the placenta provided the energy for fetal growth. This abrupt transition in nutrient supply causes major challenges to the digestive, absorptive, and metabolic processes of the infant. Until lactation is established, stores of glycogen in the liver and muscles, and triglyceride fat, help to maintain the infant body temperature, metabolic activity, and tissue growth. If the infant’s temperature falls, neural thermostats stimulate the sympathetic nervous system to release heat and fatty acids from brown fat. Brown fat looks brown because its cells are full of mitochondria, which are cellular power-houses for the release of energy from fat; it is located mainly between the shoulder blades in the newborn infant and there is relatively little in later life. Maternal body heat, and covering the head and body of the infant with clothing to reduce heat and fluid loss, greatly reduce the energy and fluid needs of the newborn. Once the immediate needs for an adequate supply of oxygen have been met the infant normally within minutes begins to seek a supply of water and nutrients at the mother’s breast. During the first few days the mother supplies colostrum, which is specifically designed for her own infant in that it contains antibodies, cells, and other protective substances which will safeguard her infant from virtually all of the infections to which she has been previously exposed. Over 90% of the fat present in human milk can be digested and absorbed by the infant intestine. Fat digestion is possible because lipases are present in the milk, and are also released from glands in the infant tongue. These enzymes remain active in the environment of the stomach. There are no digestive enzymes for protein in human milk in the infant’s stomach and duodenum. This is significant because there are important proteins in the milk, immunoglobulin and growth factors, which might otherwise be damaged before they can be absorbed from the intestine. Weaning is the process of expanding the diet to include foods and drinks other than breast milk or infant formula. A Department of Health working group in 1994 recommended that most infants should not be given solid foods before the age of 4 months and that a mixed diet should be offered by the age of 6 months. Cow’s milk is not recommended as a main drink during infancy but during the second year it can make an important contribution to the intakes of several different nutrients and energy. Factors which influence growth are genetic, nutritional, endocrine, and psychosocial. Malnutrition, specific nutritional deficiencies, and disease can prevent children from achieving their genetic growth potential. They are completely dependent upon their parents for their nutritional needs and brain development through nutrition. At birth much of the underlying brain and neuroendocrine system development is equipped to integrate newborn infant body functions, but it is becoming evident that if there is failure during the first year of life to use and develop good patterns of response to a given stimulus from the environment, then there may be significant impairment in the ability to respond in later life to stresses both physical and emotional. I propose we begin educating parents and children now, in the family and through courses in our public school system, in an understanding of the fetal uterine environment and the moment of birth. If we could sensitize this generation with an appreciation of the responsibilities they undertake when giving birth, perhaps they will begin to improve the next generation and we could begin to end this cycle of poverty and sloth in our society. I owe my understanding of this subject to Forrester Cockburn, Emeritus Professor of Child Health at the University of Edinburgh and a Fellow of The Royal Society of Edinburgh. We blame our Public Educational System because we say they aren’t producing educated children. We pile on teachers because we say they are lazy, self serving, and cannot teach. We blame teacher unions for protecting incompetent teachers, who cannot be fired. We say these teachers and their unions are destroying the future of our children, the future of our country. Our politicians throw billions into this seemingly corrupt and incompetent system and we blame them for pandering to unions and teachers. When you think about it we have conjured up an amazing array of scapegoats for our failures as parents to birth and raise our children so they are able to be educated. I am not excusing the system, its teachers, or their unions. I was a teacher once. I was compelled to join the union, whose dues were deducted from my check. I know the public educational system is crumbling, figuratively and literally and I don’t much care for politicians. All of this awareness and finger pointing does not solve the problem of educating our children. It only keeps the blame game going on endlessly with no hope in sight for resolution. However, it does make for empty cocktail conversation that resolves nothing. Instead of beginning at the end; let’s begin at the beginning. I read an article this morning, “At Risk From the Womb“, by Nicholas Kristof of the New York Times. He is a man who champions the rights of women from all over the world and has written a book with his wife called, “Half the Sky: Turning Oppression Into Opportunity for Women Worldwide”. I admire his honest writing. His article points out that the uterine environment is a critical factor in determining the mental and physical success of the child. He says, “Researchers are finding indications that obesity, diabetes and mental illness among adults are all related in part to what happened in the womb decades earlier.” What struck me most about this article, which I highly recommend you reading, is that a stressful uterine environment may be the mechanism that allows poverty to replicate itself generation after generation. Women who come from poverty will absorb the stress of their environment into their uterine child and instead of one generation improving the next these offspring remain dormant, stuck in a cycle of deprivation based upon ignorance. What is the true measure of a parent? Simple, straight forward, uncomplicated – Mr. Fagil Mandy is on to something in Uganda! We are buried in 4’ of snow here in the DC area. Fortunately our household has power so we are warm and I now have the time to write this post about infant brain development. The streets are deserted, the government is closed, and all is quiet. So in this silence let us go together into the infant brain. 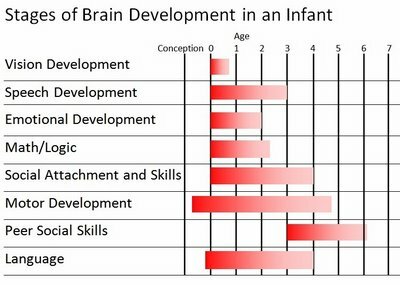 The peak of infant brain development occurs between the ages of 0 and 2. Human growth and development, through observation and neurological research, confirms our understanding that the early years of life are of critical importance for laying the foundation for a lifetime of learning and loving. The brain is the most immature of all organs at birth. It continues to grow and develop after birth. This growth was thought to be determined primarily by genetics. Scientists now believe it is also highly dependent upon the infant’s experiences. Research shows that interactions with other people and objects are vital nutrients for the growing and developing brain. Different experiences can cause the brain to develop in different ways. It is this “plasticity” of the brain and its ability to develop and change in response to the demands of the environment, that enable children to learn how to use computers as successfully as their ancestors learned how to hunt animals in the wild. Along with genetics there is mounting evidence that experiences affect the way genes are expressed in the developing brain. While good early experiences help the brain to develop well, experiences of neglect and abuse can literally cause some genetically normal children to become mentally retarded or to develop serious emotional difficulties. To understand how this happens, we need to understand a bit about how the brain works. The brain is comprised of many regions that perform specific functions, such as identifying what we see, processing spoken language, or assessing danger. Within each of these brain areas are millions of neurons, or nerve cells, which send messages to each other across synapses. These trillions of nerves and synapses and the pathways they form make up the wiring of the brain. In most regions of the brain, no new neurons are formed after birth. Instead, brain development consists of an ongoing process of wiring and re-wiring the connections among neurons. New synapses between cells are constantly being formed, while others are broken or pruned away. In early childhood the brain is genetically programmed to produce more synapses than it will ultimately use. By 8 months of age a baby may have an astounding 1,000 trillion synapses in his brain! This blooming of synapses happens at different times in different areas of the brain. Development then proceeds by keeping the synapses that are used and pruning away those that aren’t. The pruning of synapses happens over the childhood years as the different areas of the brain develop. (Huttenlocher & Dabholkar, 1997). Pruning allows the brain to keep the connections that have a purpose, while eliminating those that aren’t doing anything. Pruning increases the efficiency with which the brain can do what it needs to do. But, because the brain operates on the “use it or lose it” rule, an “over-pruning” of these connections can occur when a child is deprived of normally expected experiences in the early years. This leaves the child struggling to do what would have come more naturally otherwise. Some areas of the brain become less “plastic” or changeable when the pruning is over. This has led to tremendous concern about providing what the brain needs to prune and organize itself correctly before the “windows of opportunity” close. A fundamental task undertaken by infants is determining how they get their needs met in the world in which they live. They are constantly assessing whether their cries for food and comfort are ignored or lovingly answered, whether they are powerless or can influence adults. If the adults in their lives respond predictably to their cries and provide for their needs, infants will be more likely to use these adults as sources of safety and security. With safety taken care of, they can focus attention on exploring, allowing their brain to take in all the wonders of the world around them. If their needs are met only sporadically and pleas for comfort are usually ignored or met with harsh words and rough handling, infants will focus their energies on ensuring that their needs are met. They will have more difficulty interacting with people and objects in their environment, and their brain will shut out the stimulation it needs to develop healthy cognitive and social skills (Lieberman & Zeanah, 1995). Children who receive sensitive, responsive care from their parents in the first years of life enjoy an important head start toward success. The secure relationships they develop with the important adults in their lives lay the foundation for emotional development and help protect them from the many stresses they may face as they grow. Researchers who have examined the life histories of children who have succeeded despite many challenges in their lives consistently found that these people had at least one stable, supportive relationship with an adult beginning early in life (Werner & Smith, 1992). Increasing numbers of U.S. infants and toddlers spend hours each day in various child care arrangements because their parents work or attend school. It is critical that the care these children receive promotes their healthy growth and development. Too often child care providers are poorly trained and do not provide children with appropriate stimulation. Research has shown that in the majority of infant care arrangements in the U.S., children are not talked to and played with enough, and they do not have the opportunity to form the kind of comfortable, secure relationships with a caregiver who will promote their healthy emotional development (The Cost, Quality and Child Care Outcomes Study Team, 1995; National Center for Early Development and Learning, 1999). As our society becomes more technically and socially complex, we cannot afford to continue to allow large numbers of children to miss out on the positive experiences they need in infancy and early childhood. The costs in terms of lost intellectual potential and increased rates of emotional and behavioral problems are too high. The new developments in brain research show us what children need; our challenge is to ensure that every child receives it. When you really think this over, it is just common sense!